I am 42 years old and I have higher functioning Classic Autism (which is a developmental disability). I have a BA degree in Geography; however, my emotional / social age is like a 4-5 year old at the very best. Remember that intelligence is not the same as emotional / social age and that often Autistic people can be very smart, but they can also be far behind emotionally and socially. I still watch Care Bears, Maurice Sendak’s Little Bear, Pink Panther cartoons, and I was watching Teletubbies in college and my mom remembers me really being a Barney fan at the age of 17 in high school. Which is not usually an age most parents fondly remember their children liking Barney the dinosaur. That being said, in some ways, I’m like Joe Arridy too. I have this innocence and naiveness and yes, I have been taken advantage of, and yes, I have been bullied around by plenty of people. I’m also 100% certain that even the bullies, if I died tomorrow, would say that I was a very sweet and kind child who never retaliated or fought back. Sometimes I’ve been too nice to people and have actually gotten in trouble when people took my intentions for something else different. After reading the case of Joe Arridy, it’s very clear that he was totally innocent of anything, and an adult who had an IQ of a 6 year old was murdered here, in short. I really hate to say this, but I really hope that Sheriff Carroll and Governor Teller Ammons are burning in Hell right now, because they knew PERFECTLY WELL that Arridy was NOT guilty of murder, but they proceeded to have him executed anyway. To me, that is more despicable than, say, Charles Manson or Ted Bundy. I am trying hard not to be judgmental, but to slowly kill people is disgusting. I usually generally don’t hold grudges, I’m very forgiving actually, like some 4 year olds, but what they did is a little too much. I’m not even sure if I believe that a loving God could create a Hell for people, but if there is one, those two belong in there. If you are going to kill someone, get it over with quickly; don’t slowly torture the person to death. I also despise bullies who slowly drive their victims insane through their bullying and make them commit suicide. It would be more humane to just shoot them. I have also read that people in Canon City, Colorado, have seen a glow of light on top of Joe Arridy’s grave, because he was like a child, certainly mentally and certainly emotionally and socially. Perhaps there will be one on my grave too when I am deceased. I have been an assistant volunteer / co-host of Preschooler Storytime for 3-5 year olds at my local library for the past 15 YEARS. I do different children’s songs with the kids, and different oldies songs from the 1950s to the 1980s – one of my savant skills is that I am very knowledgeable in the field of oldies music – and we have probably done hundreds, quite possibly thousands of different oldies songs over the past 15 years. I actually want to get buried in some cemetery, somewhere, with a bunch of preschoolers / young children, because that’s where I think I will be safe. Maybe I can run around with the kids around the cemetery as a spirit and have joyful glee. I feel really bad for Joe Arridy and I feel bad for his mom Mary and his siblings and aunt that they had to see this happen to their innocent child or nephew or brother. If this isn’t a good enough reason to get rid of the death penalty, I don’t know what is a good reason. I have never been for the death penalty to begin with, as soon as I learned what the death penalty was, which was when I was chronologically 8 years old. I have had many friends who have been toddlers and preschoolers over the years and firmly believe that none of them would be in favor of the death penalty. We teach our children how to hold grudges and how to not forgive, and to be pro-death penalty. Usually kids don’t hold grudges till they are 8 or 9 years old. I remember someone commenting about Casey Anthony and her murdered daughter Caylee that “I know it sounds sick, but I fully know very well that if 2 year old Caylee was alive, she would hug her mother and totally forgive her of what she did to her”. Damn right. If the death penalty is something to be so proud of, then we should be airing it on the TV. If it is something we should be proud of, our children should see it. Put it on PBS right after Sesame Street or some other children’s TV show, and let everyone see a live execution. At least one of the reasons we don’t do that is because we are afraid that our children will protest and say “why are we doing this? Why do we need to execute people”. And we are afraid of being judged by our own children. It’s very clear that this is true. I refuse to “grow up” if it means that I need to hold revenge feelings or that I need to be for the death penalty. In any case, it doesn’t matter anyway because I can’t grow up, that I am stuck like a 4-5 year old emotionally and socially. I think that I have more rights to act like a 4-5 year old than, say, one of those adult babies who have a diaper fetish. It’s great that they can go and (as they say) “actively set aside their maturity and act like a child”. The majority of these people can act like an adult when they need to and work in their job. That’s great that they can do that, because I can’t even act like an adult even when I want to. Working with me is like a nightmare because I am disruptive and I have a very poor, poor attention span (I can’t concentrate more than 20-30 minutes, and that includes driving….I have a driver’s license, but virtually I don’t drive because of my attention span), and poor social skills. It would be more reasonable, if child labor was legal, to hire a (nonautistic) 7 year old to be a secretary, than someone like me, because they would have a better attention span than me. At any rate, if “adult babies” can wear diapers and onesies and baby clothes, I don’t see why on Earth that I can’t wear overalls or wear “longalls”. I have 1000 times more reasons because I actually do act like a 4 year old – and can’t help myself. For those of you who don’t know what a longall is, they are very common only in the Deep South like Alabama and South Carolina. Different than overalls; there are no suspenders or hooks unlike Oshkosh B’Gosh for instance. Rather, it is an outfit that looks similar to a jumper that buttons on the shoulder. It usually is made of gingham, but sometimes seersucker, corduroy, or (also common) cotton / polyester. Often times, the longall (short longalls are called jon jons) has smocking on the front, and the bib is much higher than a standard overall, as it goes around the child’s neck. Often worn with peter pan collar shirts, kneesocks, and saddle shoes, although there are quite a lot of little boys who wear them with T-strap Mary Jane shoes (or English sandals – the double buckle T-strap shoes). It is definitely more upscale and more fancy than overalls. But I see no problem in dressing like this if I want to, since I am indeed emotionally and socially 4 1/2 years old, and I suspect in some ways mentally, I may be a little like that as well. Of course, with my Autism, that isn’t unusual. A lot of people with Autism aren’t understood because people can’t reconcile how they could be so brilliant on one hand, and yet be so far behind in other ways. That applies to me too. I’m very brilliant at locational Geography and oldies music, but in some other areas, like emotional and social age, and even things like tieing shoelaces (I still have no idea how to tie shoelaces and wear loafers; although if I wore longalls, I probably would wear T-strap Mary Jane shoes), blowing my nose, or skipping, I cannot do. And I don’t pick up on social cues either. If you aren’t interested in what I am saying, I can’t tell that by looking at your facial expressions. A normal nonautistic 3 year old would even decipher that. Most people who know me well and have been spent a reasonable amount of time would say I am like a 4-5 year old emotionally and socially, and so does my psychiatrist (I see him because of the Autism and the medication I take). But, to summarize, they knew perfectly well that Joe Arridy wasn’t guilty of this, and they had him executed anyway. I realize that all the prisoners realized this too – even the ones that were guilty of murder – and the warden knew this as well, and they well knew that a 6 year old “adult-child” was going to die. I wonder if Warden Best, since he was against this and cried when he got executed, could have defied the orders of the court or the governor on the grounds that the prisoner was indeed not guilty as it was very clearly obvious. And even if he was guilty (which he was not), his IQ should have been a reason to bar his execution in itself, as his IQ was 46 which is equal to a 6 year old. Nowadays, in the USA, you can’t even be executed if you have an IQ less than 70. Because at that point you are intellectually disabled. Although intellectually disabled meanings vary. Also, my IQ is probably higher than 100, but the thing is maturity wise, I’m less than a 5 year old. I was called the R-word by literally everyone in the residence dorm apartments at my university. I have a friend who is 54 years old who is mildly intellectually disabled and is perhaps like a 10 year old, yet she can hold down a job at FedEx Kinko’s and the high school, and my parents have met her (I knew since I was in high school as she helped out in the special ed department of my high school and still does), and she may be like a 10 year old maturity wise, but my parents think she is more mature than me – a lot more. My dad said 3 times over the past 3 months that my 6 year old nephew is actually more mature than me. And even people with higher functioning Asperger Syndrome seem to think that if I am less than a 6 year old. One of my math teachers from community college who has known me for 24 years thinks I’m like a 3 year old or even 2 year old. I still have this egocentricity, not that I am selfish, but self centered, as in things go back to me. Egocentricity is not necessarily selfish because a 5 year old who blames himself for his parents’ divorce is egocentric because he thinks he is responsible for everything, but that is far from being selfish, and I know children who are 4 that even give to charities. But egocentric in my case in that even when I had Finite Math with this instructor years ago, I would stand up and block everyone’s view of the blackboard, writing down all his notes. I didn’t realize there were people behind me wanting to see the blackboard. Or that there were 6 people in front of me wanting to ask a question, standing in line, before me. Also, not surprisingly, most of my friends are young children or adults over age 60. Most people in their 20s and 30s don’t accept my Autism and they just make fun of me and bully me. And even among my friends who are young children, I feel that their parents “infantilize” me, I suppose that is okay in my case, but if I get invited to a child friend’s house, it’s like a 5 year old inviting another 5 year old friend. I should be the parent’s friend because they are closer in age to me, but instead, it seems that the child is my primary friend and the parent is a secondary friend – only a friend because of my primary friend – only because they are the mom or dad of my friend. Pity is Sheriff Carroll got away with murder. I wonder if there are any descendants of this murderer and I wonder what their thoughts are about him. They probably think he was a good man who is now being wronged. If Joe Arridy has ‘here lies an innocent man’ on his grave, then Sheriff Carroll should have ‘here lies a guilty man’ on his. Let’s not forget that not only Sheriff Carroll was guilty of this, but also Governor Teller Ammons. 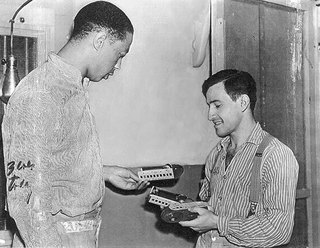 He too knew that an innocent child – adult was going to be executed in the gas chamber and didn’t do anything to commute his sentence in the very least, although he should have had the courts overturn his conviction as he (Joe Ariddy) wasn’t guilty in the frickin’ first place. I can’t imagine what was going through poor Joe Arridy’s head when he was being gassed in the chamber. Or maybe he thought he was going to a better place. Maybe he did, if you are Christian (I am), he went to Heaven. I’m not sure if I can say the same things about those 2 cowards and liars that were okay with him being executed for some crime he didn’t even commit. I totally do not like people who take advantage of others who are developmentally disabled. I have higher functioning Classic Autism and I act like a 4-5 year old emotionally and socially, and I’ve been bullied all my life, it seems. I have a friend who has a 5 year old son with the same level of Autism that I have, in North Carolina. I worry about him actually because based on my experiences and what I have seen other people with Autism go through, I can almost guarantee that in high school and college (if he goes to college), he will get bullied and get called the R name all the time, or even kicked around. People are more understanding and tolerant of criminals (even felons) than of developmentally disabled people, including Down Syndrome, and Autism. Although people are kinder to those with Down Syndrome because you can tell that someone has Down Syndrome, versus with Autism, because Autism is an “invisible disability”. At age 42, I still get bullied, especially on the internet, often by the “liberal” socialists in Oregon, especially in the Portland and Astoria area. I don’t know why they are always from that area. For being “liberals”, they sure aren’t understanding of disabilities at all. They aren’t very tolerant of eccentricities or people having Autism. I want to move to South Carolina. I live in the West Coast, thankfully not in Oregon though. Take care – Codi Preston D.
If we needed any more evidence of the implicit barbarism & fallibility of the death penalty, we have it here.